Ready to reach a new personal best? This training plan will build your strength, speed and endurance. Don’t forget to stretch! It’s important to start each training session with some stretches and gentle movement to prepare your body for your workout. After your session, cool down with more stretches to help with recovery. 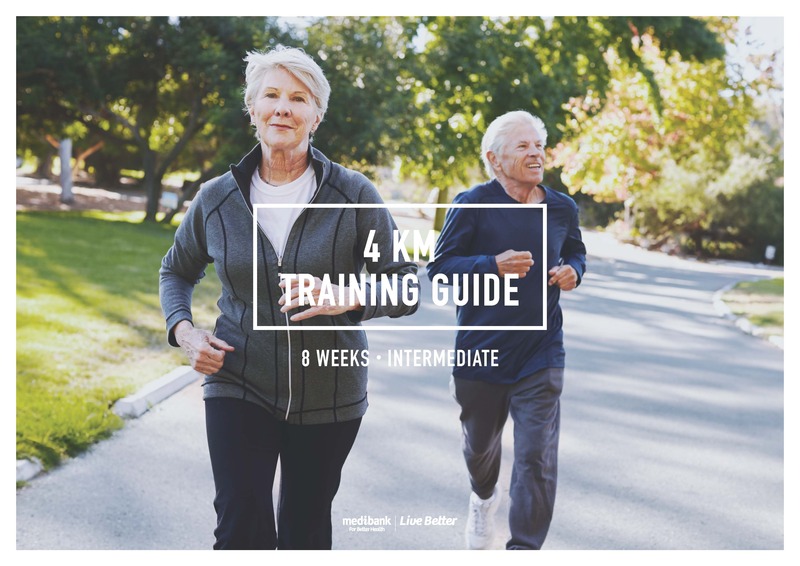 If you’re getting comfortable running 4 km and want to up your intensity, this is the training guide for you. Over 8 weeks, you’ll improve your speed, strength and endurance, so you start hitting new personal bests. Long run: Each weekend in this guide includes a long run. Run these at a comfortable pace – don’t think about how fast you’re going, just enjoy getting your legs moving. This is also a good opportunity to try out new courses or even go off road with some trail running. If you feel fatigued, take a drink break or slow down to a walk. Interval training: This is how you improve your speed. Interval training involves bursts of running at an increased pace, followed by a recovery period running at a slower pace. For examole, run 400 m hard and fast, and recover by jogging or walking 400 m, then repeat. Before interval training it’s important to warm up by jogging a kilometre or two, stretching, and doing a few sprints of 100 m. Cool down afterwards with a short jog. Rest: Rest days are an important part of your training. They give you an opportunity for your body to recover and your muscles to build in strength. Don’t be tempted to skip your recovery days – giving your body a rest will lead to better results in the long run. Test: Week four includes a 4 km test, which is a timed 4 km run to track your improvement. If you don’t feel ready for this, head out for a solid 5 km run. Stretch + strengthen: Stretching is key to a strong, supple body and should be done daily. Strength training, particularly for your core muscles, is an important focus of this training guide. Try bodyweight-based activities like push-ups, chin-ups or dips, or light weights with high reps at your local gym.